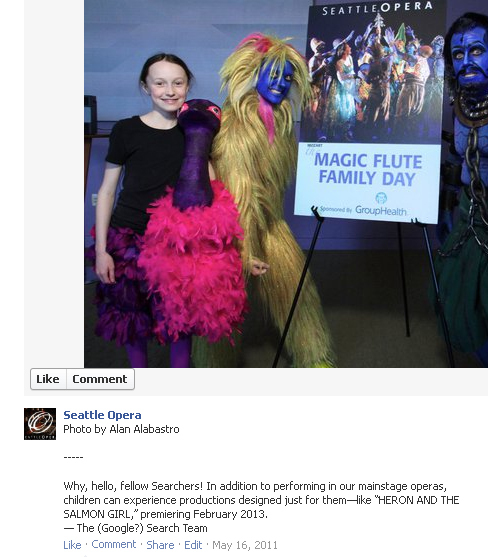 Next, you would have needed to head to Facebook--specifically, the Seattle Opera Facebook page. 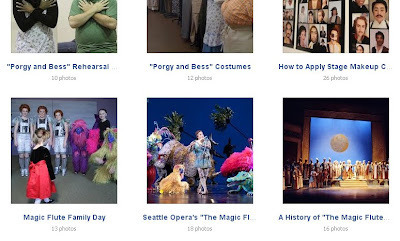 If you had scrolled through our many photo albums, you would have found one titled "Magic Flute Family Day." 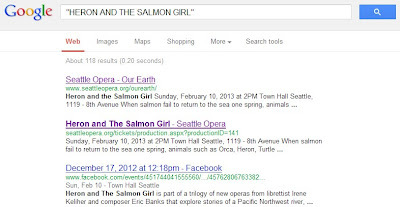 This clue was a little difficult, but it hinted that you should try searching Google for "Heron and the Salmon Girl," which is the name our first Our Earth opera. 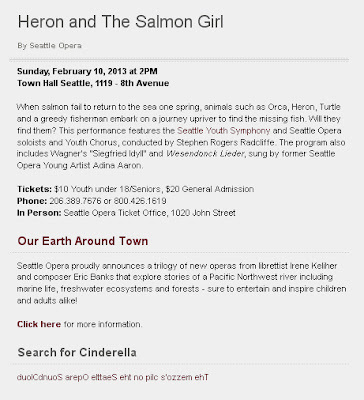 You would have been given a few different options, but only one had "Heron and the Salmon Girl" prominently featured in its title (the second link in the photo below). 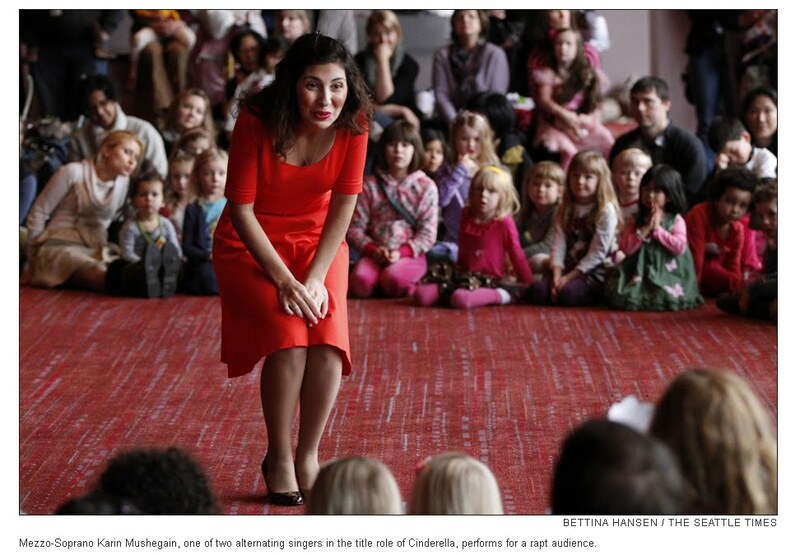 The final photo was of Karin Mushegain, who sings Cinderella in our Sunday/Friday performances. 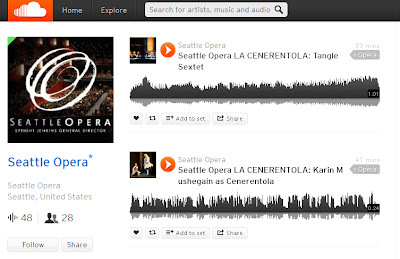 The earlier two-part clue indicated you needed to find Karin's clip on the Seattle Opera SoundCloud page, where we upload lots of great clips from our performances. 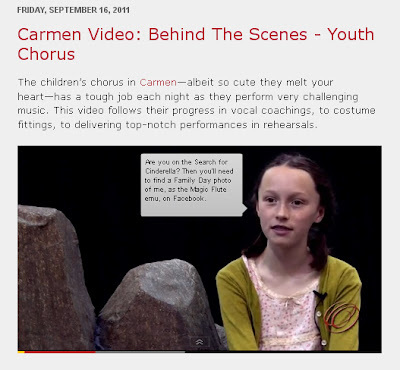 Had you navigated to that page, you would have noticed that the second clip is of Karin--but it wasn't a musical excerpt. That audio clip was actually a special message from Karin to you, congratulating you for (nearly) making it to the end of the hunt. 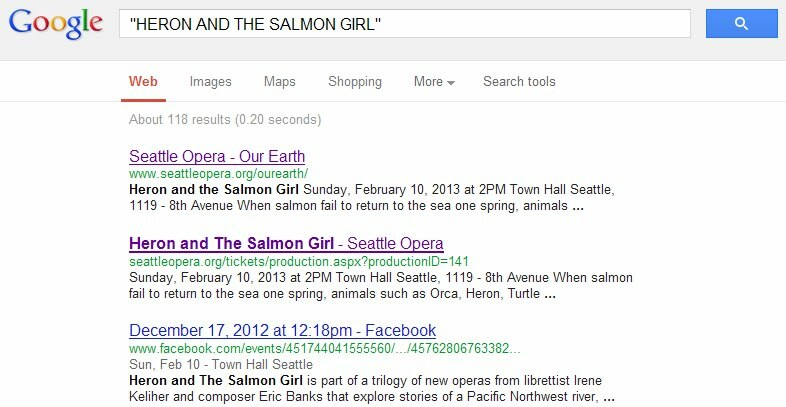 She also gave you the super-secret address to e-mail--DancingRats2013@gmail.com--in order to claim your free tickets! 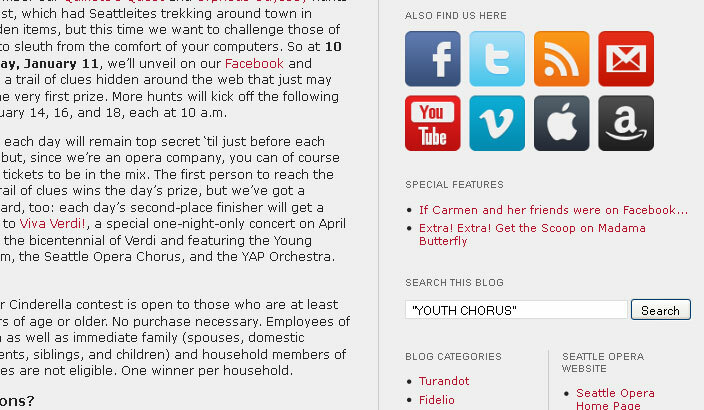 Phew, that was a tough one, but we hope the winners enjoy their prizes, and that everyone who participated had fun on the trail. If you didn't win this time, come back on Wednesday and Friday at 10 a.m. when we do our final two rounds of the Search for Cinderella! 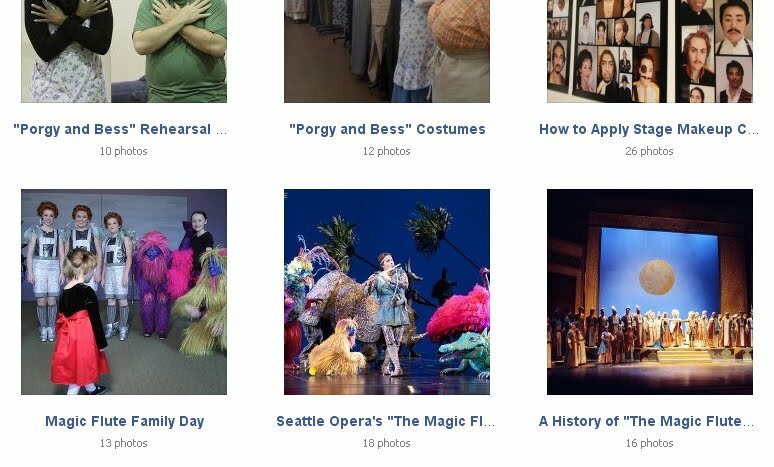 Those next prizes will remain top secret 'til each hunt begins, but trust us--they're pretty awesome! Wow, that WAS tough - congrats to the winners! 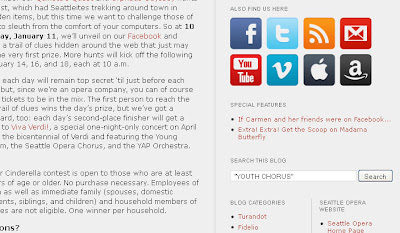 The digital scavenger hunt is a really fun idea! 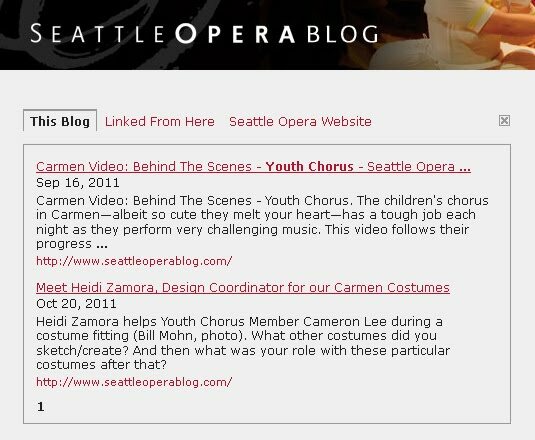 Perhaps if you do it again for a future opera, you could schedule some of the hunts to kick off in the evening or on weekends, for those of us who work during the weekday?